Clarks very comfy slip on pale blue sandals size 6 very good condition. LOVELY DARK GREEN, 100% LEATHER WEDGE SLIDERS BY CLARKS. ADJUSTABLE BUCKLE ACROSS THE FOOT. Clarks White Leather Slip On Floral Sandals Size 8. Condition is Used. Dispatched with Royal Mail 2nd Class. BRAND NEW CLARKS: Aisley Lily Tan Combi (70's Style) Size 6 With Box. Condition is New with box. Dispatched with Royal Mail Signed For® 2nd Class. Smart,comfortable sandals from CLARKS Springers. Beige colour,size UK 7.5 in good used conditions. 2x Slides/ Sandals, Both show signs of wear as shown but otherwise Wearable and In Great Condition. 1 - Clark’s White Leather Slides. Size 6.5 UK. 2 - Marks and Spencer’s Orange Leather Slip On Mules. Size 6.5UK Heel Height 1.5”. SLIP ON / MULES. A PAIR OF TRULY LOVELY SANDALS. WOODEN EFFECT HEELS. DARK BROWN / CHOCOLATE COLOUR. SLIM FIT NARROW FIT FOR A PERSON WITH SLIM FEET . 100% LEATHER. NO MATTER WHAT. CLARKS SPRINGERS WASHABLES 100% LEATHER MULES, SIZE 4.5. Lovely slide on sandals by Clarks Artisan * Size uk 7 * standard fit * white patent leather upper * Velcro regulated toe strap * cork / rubber sole Sandals are in excellent condition. Please see photos for more details. Item will be sent by a myHermes courier. Let us know if you prefer Royal Mail. Thank you for looking. A PAIR OF TRULY LOVELY SANDALS / MULES. WOODEN EFFECT HEELS. LOVELY, VERY SOFT LEATHER. BLACK COLOUR. Clarks Ladies White Wedged Sandles Size 8. Nice little summer sandles Bought but only worn once so almost brand new Wedged Synthetic materials Please take a look at my other items, i can combine postage where possible. All items are dispatched within 1-2 days. Please make payment as soon as possible after buying. Thanks for looking. SLIP ON / MULES. A PAIR OF TRULY LOVELY SANDALS. WOODEN EFFECT HEELS. SLIM FIT NARROW FIT FOR A PERSON WITH SLIM FEET . 100% LEATHER. NO MATTER WHAT. DARK RED / BURGUNDY COLOUR. EXACT HEEL HEIGHT. 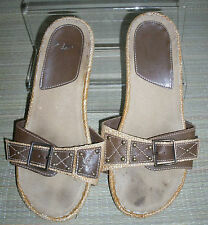 Great pair of casual slip on sandals size 8 by Clarks in nearly new condition.